More than 70 percent of employers are using LinkedIn to recruit and hire new employees, so having an effective profile can be the difference between being the preferred candidate and getting beaten by the competition. Here are 10 of our favorites from the postcard and our interview with the Likeable Local CEO. Marketers can learn a lot from a simple game of 'would you rather'. The companies and nations that are leading the way in innovation and research. Where are all the retail companies? The apparel category has a uniquely high level of competition even for the largest brands. So who’s breaking through? You may already have a great LinkedIn profile but how do you make it even better? A key tool to build your personal brand. Like the internet and GPS before them, drones are evolving beyond their military origin to become powerful business tools. From Goldman Sachs. The buying bloc is more populous than millennials and moms. Give consumers a reason to believe in your company, and they will give you their loyalty and their activism. Understanding what your prospects really want to read and talk about in the decision making process is key to success in a modern sales world where patience is lacking and the pressure is on to seal a deal. 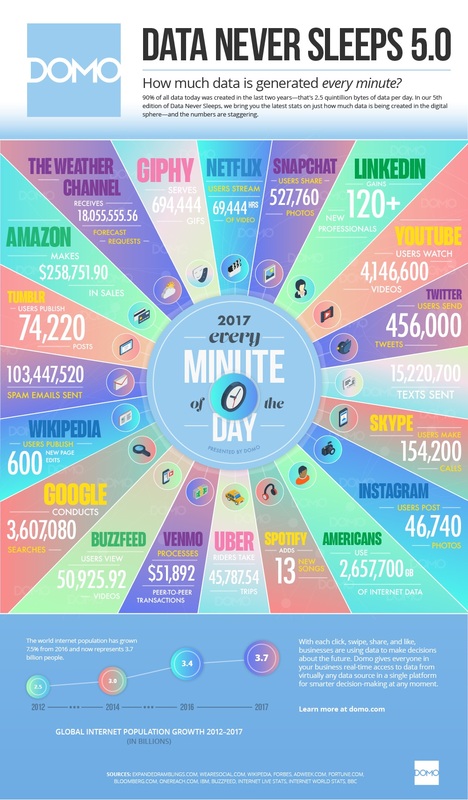 Data Never Sleeps - 90% of all the data today was created in the last two years - that's 2.5 quintillion bytes of data per day. From Domo, great list of data insights. More than half of employees say they love their jobs. Employee screening company EBI surveyed 2,000 workers to find out how they feel about their jobs. Practical advice from the Entrepreneur on winning that argument using a few simple tricks and debate like a pro. The Evolution of Influencers - Check out this infographic to trace the origins and also see some of the players and intricacies of the art and science of the influencer economy.